A question I've been asking myself lately is this: Why is it that so many choral conductors treat their singers like children? I'm talking adult ensembles here, not ones composed of minors. I don't want to over-generalize as I know that the field has conductors that do not behave in this way. But judging by what people who've sung with a number of groups over the years have told me, the trait among music directors of patronizing their singers runs strong. It must be part of the job description. I wonder whether the reason for this (or part of the reason at least) stems from the fact that choral singing is in many cases a pedagogical activity. It's the one music-making format with universal application possibilities. 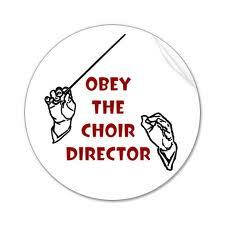 Many choral directors experienced singing in choirs as kids and many of them have directed ensembles of children, youths, students or maybe adults with no musical training whatsoever. The pedagogical aspect of the job mistakenly makes them think that they can talk down to the vocalists. But the habit is exceedingly counter-productive, not to mention denigrating and annoying: As far as I can tell, music directors get better performances from singers when they don't harangue them as one might a naughty schoolchild. Plus, good singers are more likely to stick around than seek other opportunities if they feel like they are being treated like normal human beings.